Acting Balanced: Baby Store Plus Thrifty Thursdays deal! Baby Store Plus Thrifty Thursdays deal! This weeks Thrifty Thursday Deal is just the motivation you may need to get yourself and your little one outdoors to soak up some sunshine, fresh air, and get some exercise too. Spring will be here before you know it...I promise. Take advantage of this Super Deal to Save $100 Off the Regular Price Plus get FREE* Shipping! 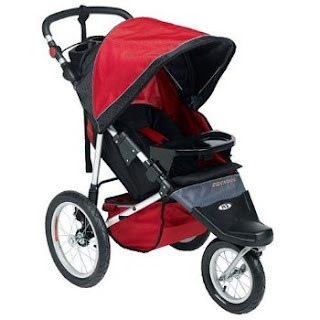 on a New Schwinn All-Terrain Jogging Stroller! Don't worry, you don't have to jog to really enjoy this stroller. It has a Built-in Wind and Rain Cover...just in case :) and large 16" rear wheels and a 12" swiveling front wheel so it can easily maneuver in tight spaces while smoothly handling any terrain. The rear suspension system ensures a comfortable ride for your little one. The convenience parent tray, child tray, pockets, and spacious underseat basket provides plenty of storage space to hold all your goodies while you are out for a walk around the park, up the city streets, or down a country road. We have two colors that would be appropriate for either a boy or girl in either the Blue & Green color or the Red, Grey, & Black design. 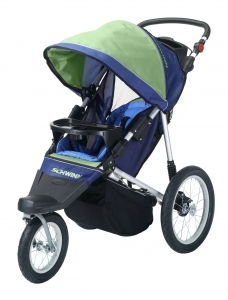 This stroller is regularly priced at $249 but today only, for Thrifty Thursday you can pick one of these Schwinn Free Wheeler AL Jogging Strollers for just $149 and we will ship it for *FREE anywhere in the lower 48 US States!! Use Coupon Code "TT-Schwinn" to receive $100 OFF and Free Shipping* at Checkout! Coupon Code Expires at 11:59PM (MST) Thursday!